Grabbing a paper towel in a public washroom may leave you with more on your hands than you bargained for. New research commissioned by Dyson shows that paper towels can harbor bacteria, which can be transferred to your hands, mouth and face. 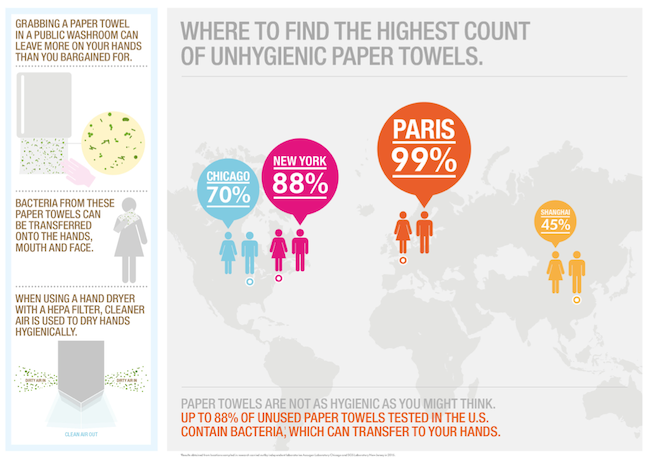 In analyzing paper towel samples from around the world, the study found the dirtiest paper towels in Paris, with 99 percent of unused paper towels containing bacteria. Close behind was New York with 88 percent, Chicago with 70 percent, and Shanghai with 45 percent. Research in the US was carried out by the Accugen Laboratory Chicago and SGS laboratory New York. Paper towels were taken from restaurants, retail stores, luxury hotels and hospitals in each city. But it’s not all about the environment in which these paper towels are held. A study in The American Journal of Infection Control shows that paper towels can actually pick up bacteria during the manufacturing process. The findings also concluded that the bleaching process for recycled paper does not significantly reduce the concentration of bacteria. In fact, the numbers of microorganisms in recycled paper were up to 1,000 times higher than in virgin paper towels. Hands are a major vector for harmful microorganisms, with 80 percent of infectious diseases being transmitted by touch, according to reports from Infection Control Today. Damp hands can spread 1000 times more bacteria than dry hands. Therefore drying your hands becomes increasingly important.